This is the first in our ongoing series about films that were banned by the British government, using the Video Recordings Act of 1984. You have the right-wing gutter press and a few Christian pressure groups to thank for these films becoming more famous than they had any right to be (in all but a few cases), and the fact they’ve now virtually all been re-released, uncut, while the law remains in place, tells you more about moral panics than it does about the content of the films. See the VRAs “mission statement” here. We start with a woman having a shower in the middle of the woods (my thought: did her shower break down, and the nearest one was in the wilderness?) and a couple of men tracking her with guns. Now, this is a fairly clever fakeout by the director, as it’s revealed that the woman is part of a large group of “hippies” growing tons and tons of weed in the remote countryside, and the two guys with guns are federal agents. There’s a fight, the woman is shot in the throat and the two feds are beaten to death, and from that seed this film grows. The feds are reported missing after a couple of days, and their bosses decided that rather than cover the 60 square miles of wilderness, they’ll just use a highly experimental, untested herbicide called Dromax in a crop-duster. Nothing could possibly go wrong with that, right? The local crop-duster pilot is a mean old alcoholic with a wife who gives as good as she gets in the insult department, so with them, the cartoonishly evil main federal agent and the weed growers, who only care about making as much money as possible, you’ve got a decent amount of people ready for the toxic zombies, whenever they decide to show up. The film’s “hero” is a local Fed who recommends against spraying and just wants to go on a fishing trip with his brother, but his wife ends up tagging along as well. Oh, we mustn’t forget Jimmy, who may well be the main reason this film got banned. He’s clearly supposed to have some disability (I apologise for the use of the word, but his own parents called him “retarded” during the film) and we’re treated to a clueless portrayal of mental problems done by an actor who, to the best of my knowledge, was entirely able-bodied. If it makes you feel any better, he’s clumsy and useless and only ever slows the group down too! 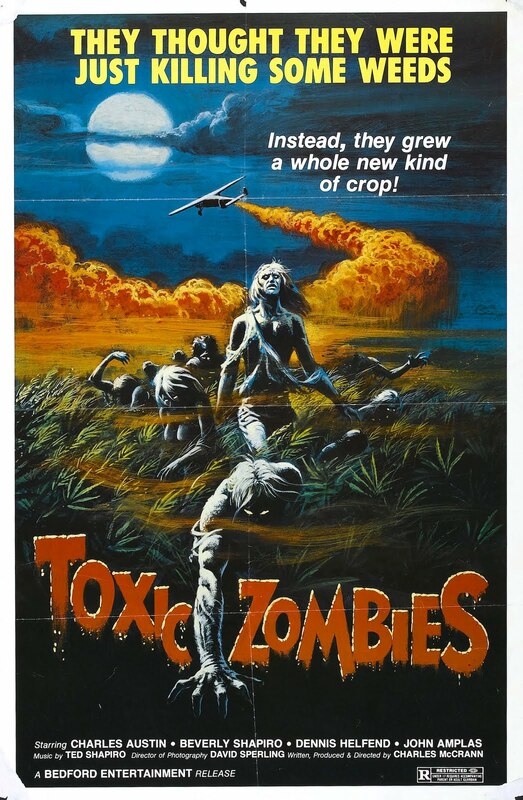 The guy playing him had an interesting career – “Toxic Zombies” was his one and only film credit of any kind, until 2011, over 30 years later, when he co-directed a documentary called “Bill W”, about the founder of Alcoholics Anonymous. Back to the film, the crops are dusted and wouldn’t you know it? The hippies and the pilot both get absolutely covered in the stuff, and it’s not only not safe, it turns everyone exposed to it into a kill-crazy zombie! 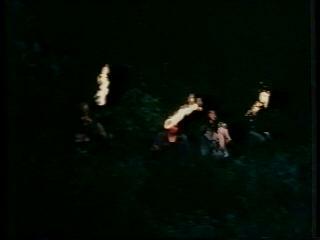 Most of the rest of the film is the zombies happening upon groups of people out in the woods and killing them in extremely graphic ways, intercut with the two Feds driving for what seems like forever (and is definitely more than a day) out to the woods to make sure no-one reports their illegal chemical use. This film is cheap. Very cheap. The sets, such as they are, seem to be in peoples’ homes – the local Fed’s office is clearly just a corner of a larger room in a house, decorated to look a bit like an office; and the pilot’s house is probably the director’s own, or something similar. But most of it is out in the woods, a sign of a low-budget production since time immemorial. Bear in mind it’s not actual wilderness, though, as you can occasionally see other campsites a few hundred yards away that aren’t supposed to be in the film, and when you see across the river you see beautiful farmland, not trees and undergrowth. The music is also hilariously bad, too. When they’re not ripping off The Exorcist (if the bigger film had been aware of the smaller one, I’m sure they’d have sued) they’re putting in stupid little musical stingers for “here comes action!” or “here comes Jimmy!” I only hope the music guy was a relative of one of the producers, otherwise they ought to have asked for their money back. Talking of people who did something to a producer in order to get a role, if the main fed’s wife wasn’t sleeping with one of the producers, then they need to fire their casting guy. You’ll thrill to the car journey scene where they crack appallingly racist jokes! You’ll wonder how a group of zombies managed to find, light and carry without dropping, flaming torches! You’ll try and figure out where those Feds were driving from and to that it took them so long! You’ll be grossed out by some pretty horrific special effects! 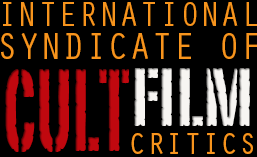 You can play the “guess which horrible thing this film got banned for” game (there are at least three options)! There’s a good case to be made for this film having an anti-Government bent,as it’s their fault the dangerous chemical gets sprayed, and a guy they meet near the end having no time for them either (with good reason, as the film shows). But it’s so cack-handed that any attempt to spin this into subtle intelligence on the film’s part is doomed to failure. Without its notoreity, this film would have legitimately been almost completely forgotten by now. It’d be at the back of a few zombie film guides, and every now and again, one of the yawnsome Kim Newman types would do an article on its status as an undiscovered “classic”. But it’s lumped in with “The Evil Dead” and other genuinely good films, all thanks to Mary Whitehouse and the Daily Mail. The director Charles McCrann also played the good guy Fed, and like Jimmy this is his one and only film credit – sadly, his post-film career took him to the World Trade Center, where he died on September 11, 2001. It’s not the worst film I’ve ever seen. 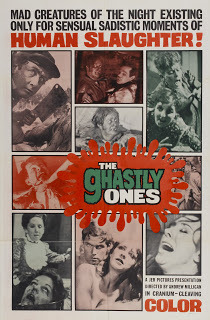 It rips along, they drop in gore every now and again and they make the people so unpleasant that you’re cheering for the zombies for most of the film. It’s just cheap and dirty and moderately offensive and technically incompetent and acted by a bunch of people who’d be laughed out of the average Amateur Dramatics group. I was so busy going on about Jimmy that I forgot to mention the hefty strain of sexism that runs through it too, but that sadly almost goes without saying in these films.